The Air Leak Detection module applies special signal processing to isolate symptoms of flow noise generated by air leakage in loudspeaker drivers and enclosures as well as ports and in orifices. Easy to interpret single value measurements qualify and quantify air leakage and many other defects (rubbing, buzzing, loose particles). This technology may be applied as an automatic end-of-line test module which seamlessly integrates in the test sequence or even in a QC Standard sine sweep measurement. Sharing the same processing kernel, the Air Leak Stethoscope is a powerful off-line diagnostics tool to auralize and trace the origin of defect distortion interactively. Gluing errors in drivers are likely to cause air leakage in the surround or the dust cap that may only be audible in the final application when the driver is mounted in a closed or vented enclosure. Such leaks may not be detected under free air conditions due to the lag of air pressure caused by the acoustical short-circuit at low frequencies. Measuring the driver in an adequately small test box provides the required in-box pressure at low frequencies to stimulate even very small driver leaks. Additionally, the test box offers ambient noise attenuation to go for maximal sensitivity in leak detection and driver testing. Detecting air leaks in large speaker systems with only one microphone leads to physical problems due to shadowing of high frequency leak noise. Placing multiple microphones around the device under test solves this problem by measuring the speaker from different sides and thus covering the whole surface. 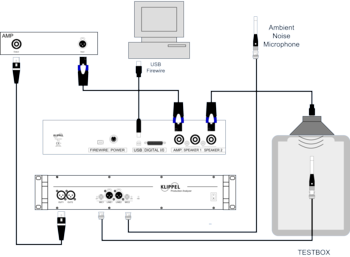 The four test microphones are switched by a signal multiplexer for sequential measurement. 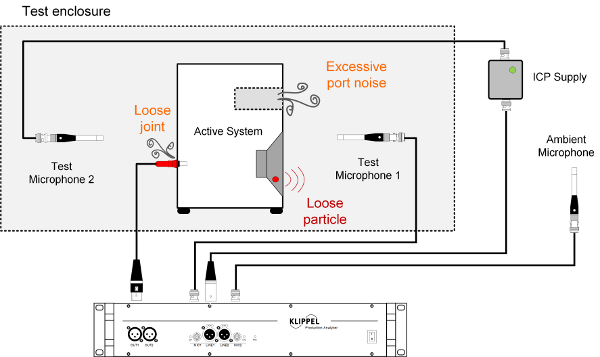 An additional far-field microphone always monitors ambient noise in parallel while the measurement chamber guarantees proper ambient noise attenuation for maximal measurement sensitivity. For high speed, comprehensive system testing the leak detection technology integrated in the standard SPL task shall be used. The standard SPL checks are extended by a dedicated test for air leakage symptoms (modulated noise) in one single sweep test. Air noise due to loose joints or even irregular port noise due to manufacturing errors (e.g. burr) in vented systems is detected. Two test microphones are located at opposing sides of the DUT to cover a wide surface. 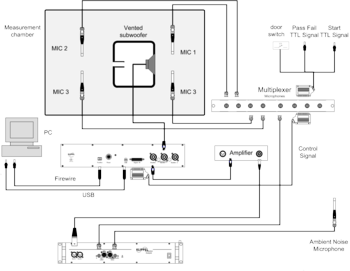 The second test microphone may be connected to the Line input of the Production Analyzer using an external microphone power supply. 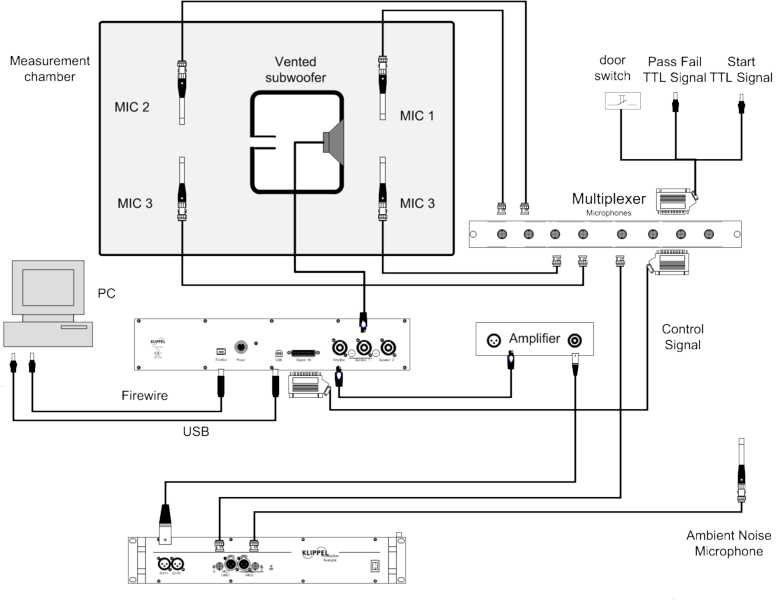 An ambient microphone in the far field detects ambient noise corruption during the tests and triggers the auto-repeat mechanism.